Beauty is all around us in the uniquely southwestern world. Our Southwestern Mexican adobe house leaded stained glass window panel is a reminder of how amazing this form of architecture is. 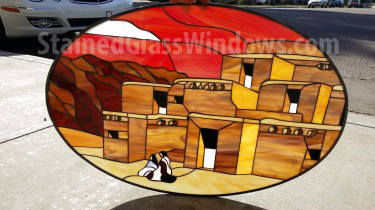 In an oval cut, it will cast warming lights of red, brown, and golden hues all over your favorite rooms while lending a stunning southwestern vibe.